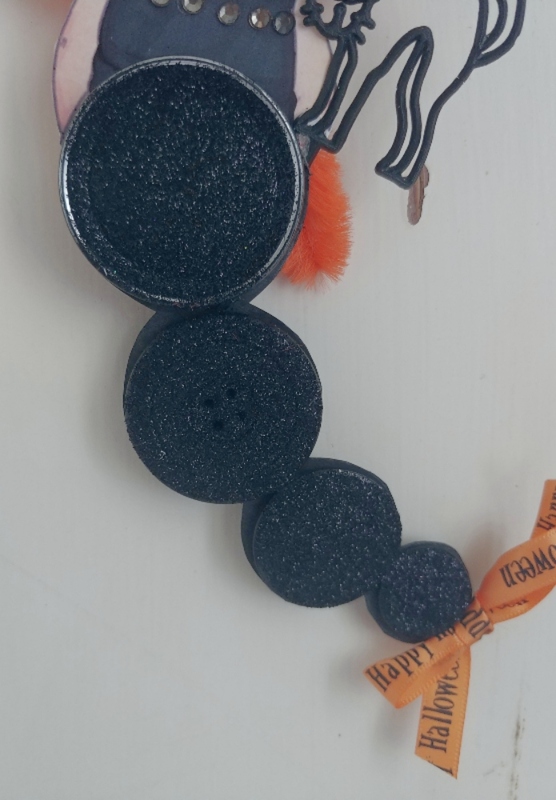 Today I have a fun little DIY to share with you! 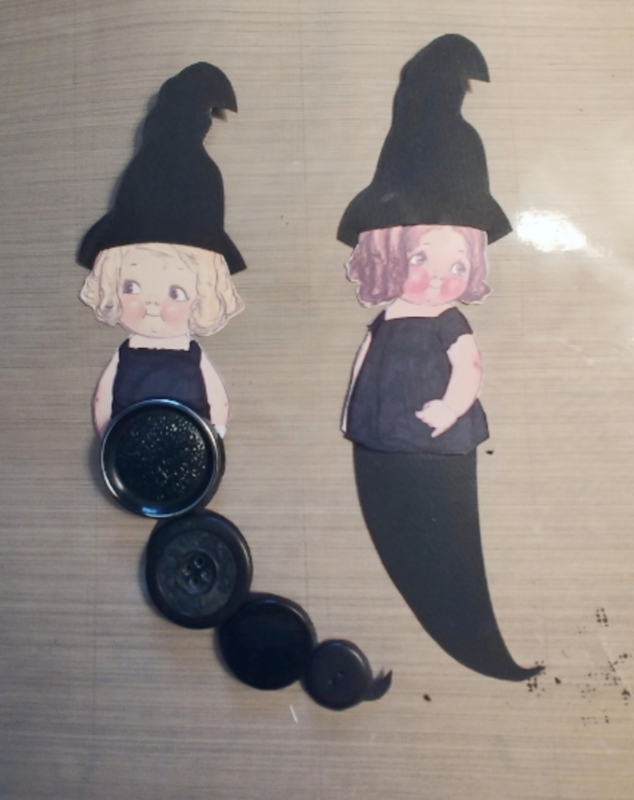 I made a few witches for Halloween a few years ago (9 years ago to be exact 😳). To this day they are one of my favorites! 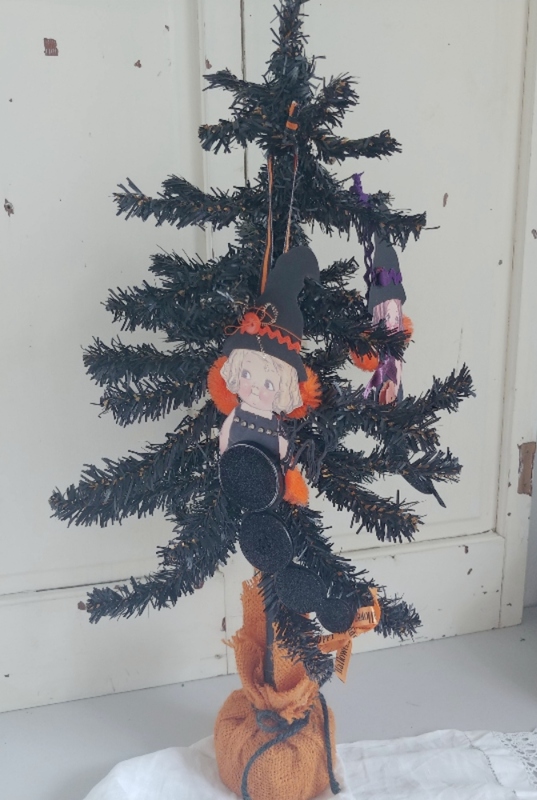 Each Halloween they make me smile when I unpack my decorations and discover them once again. 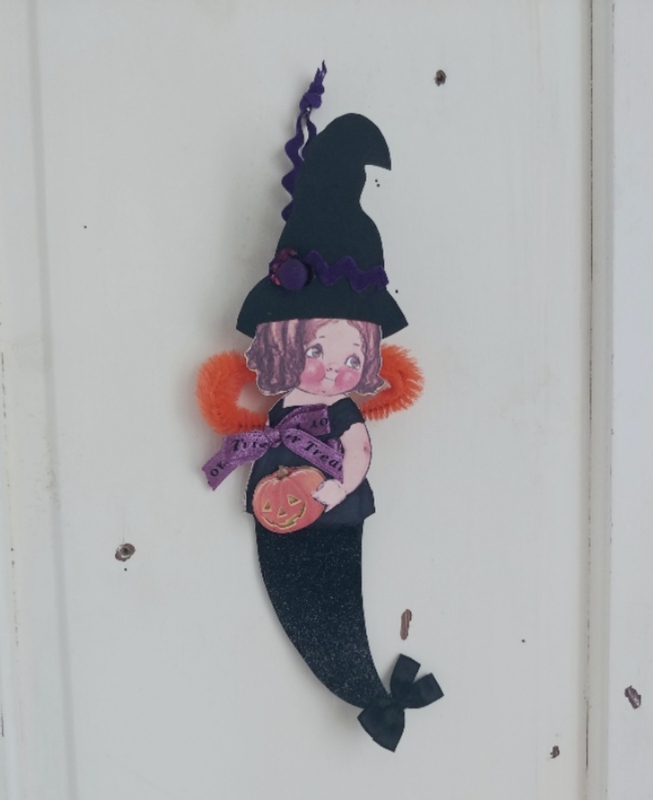 These are not your typical witches though... they are cute and sweet... kind of a cross between a witch, a mermaid, and a fairy! Can you imagine it??!! 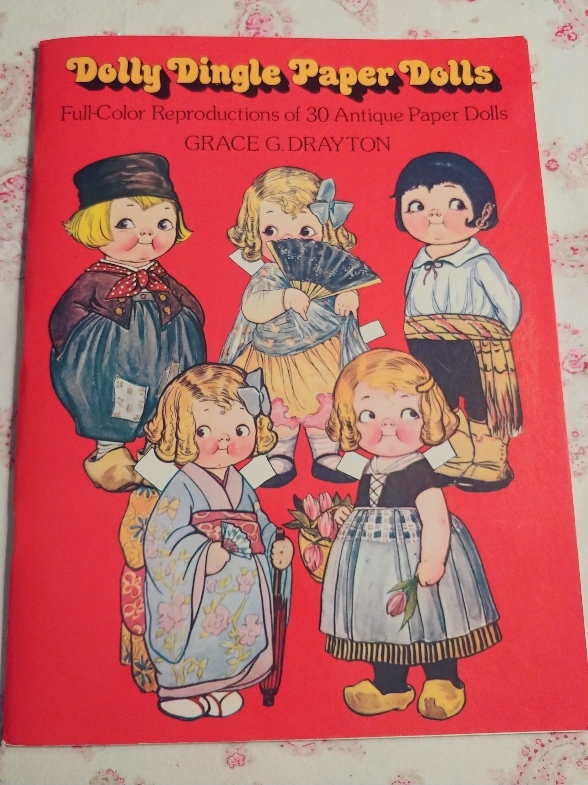 I have had this Dolly Dingle Paper Doll Book for a long time, I think I got it at a garage sale. 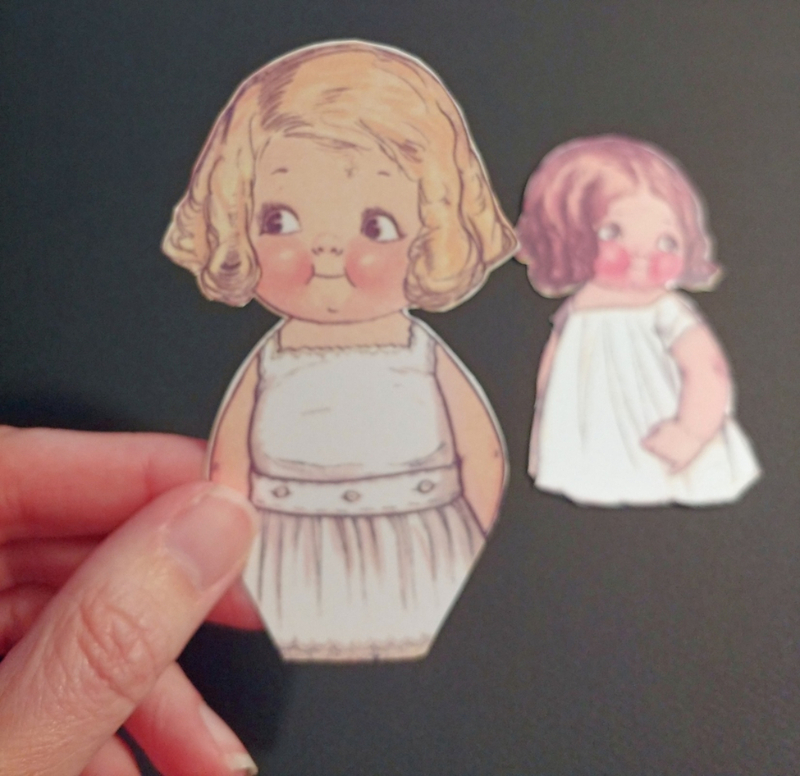 I don't want to actually cut the paper dolls out so I just copied the pages I wanted onto cardstock. 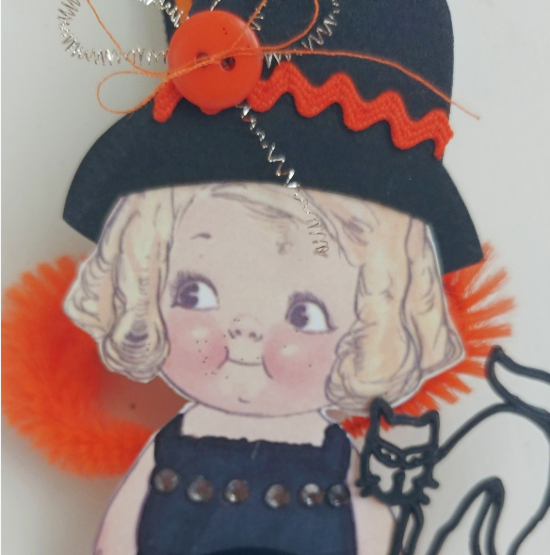 I'll share a scan of Dolly herself so you can print and make your own and if you stick with me to the end of this post you can enter to win one of these little cuties! If you are printing Dolly from the scan I provided, make sure to print on cardstock paper which is heavier weight than regular printer paper. If you don't have a printer you can have prints made at Kinkos or a FedEx print store very inexpensively. 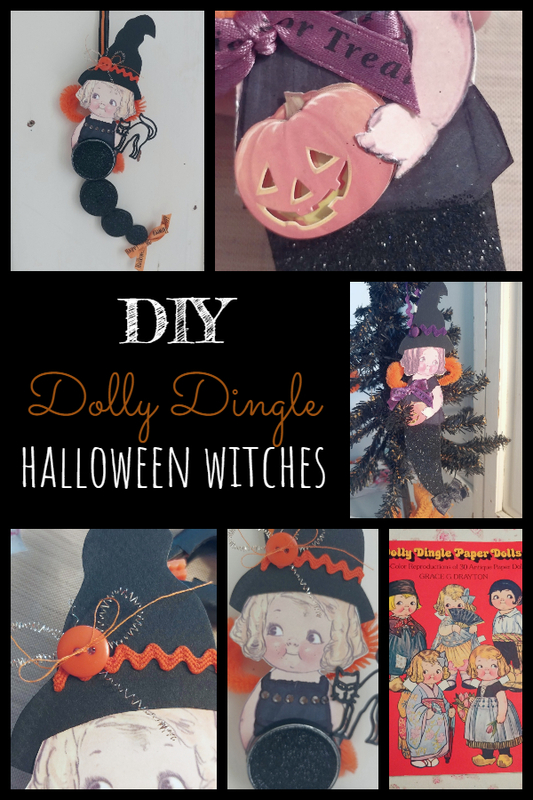 I made one little witch with Dolly Dingle and another with her friend Highland Mary! 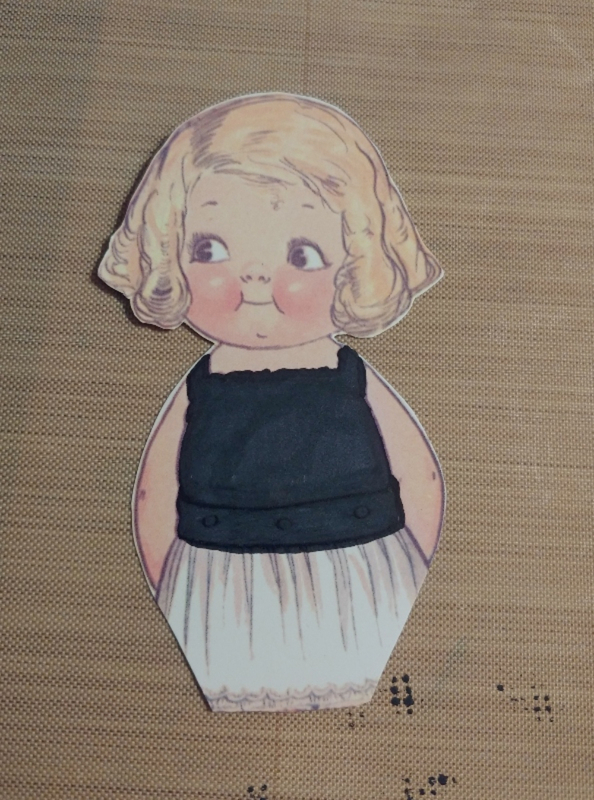 Cut out Dolly; you can cut her off at the legs and then taper the edges of her slip a little bit. Now, color her top with a black Sharpie marker. 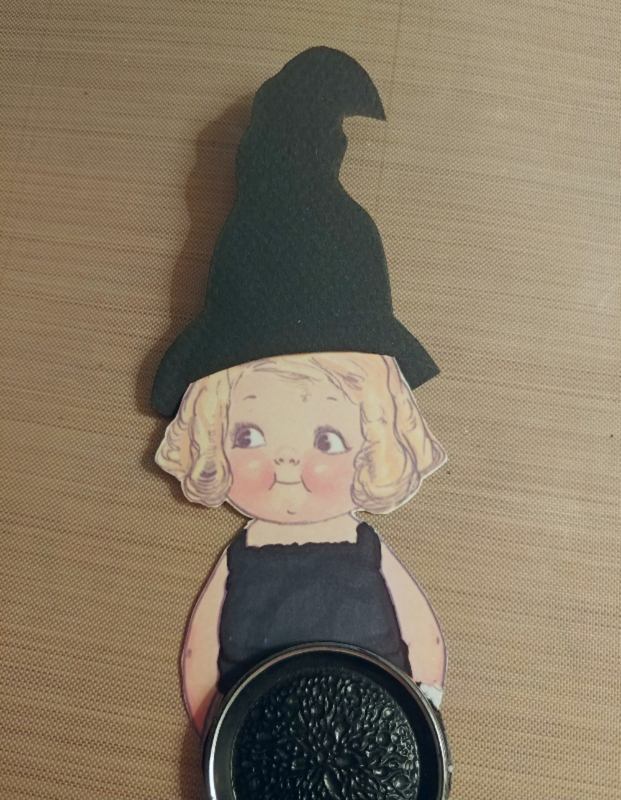 You could color her a different color but I thought black was appropriate for a witch! 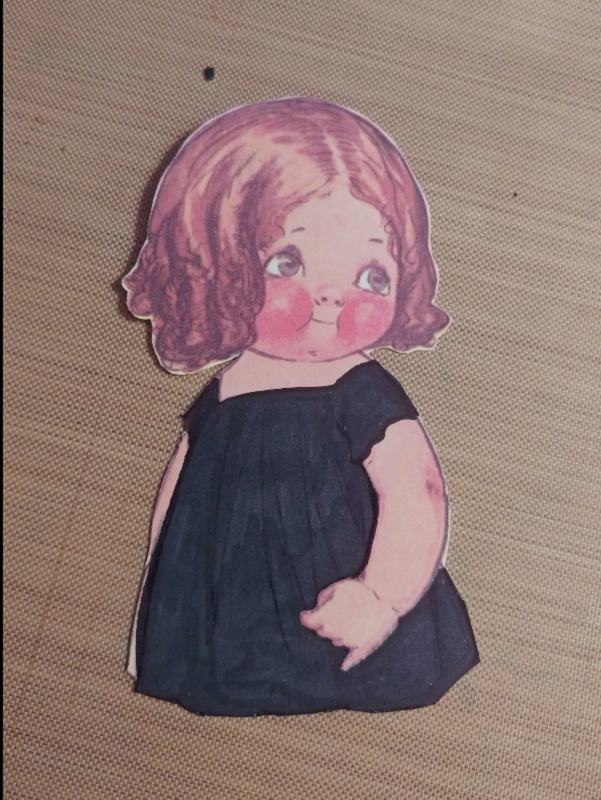 Here is Mary with her slip colored in. Now we are going to create her tail... originally I designed this to be a skirt that was tight at the ankles but it ended up looking more like a mermaid tail! 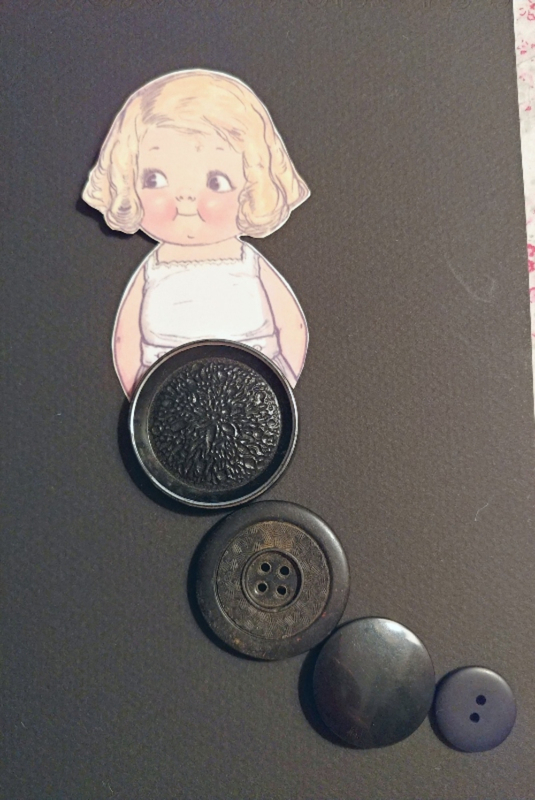 Lay her down on a piece of black cardstock and arrange the buttons in a curved tail shape (don't glue them down just yet). You'll start with a very large button (about the size of her head). It should cover most of her skirt, then each button making up her tail will be a little smaller. They don't have to match, in fact, I think it's cuter if they don't! Once you have them arranged how you want, trace around them with a pencil. Cut this out and then glue it over the lower half of Dolly. Now, glue on the buttons. 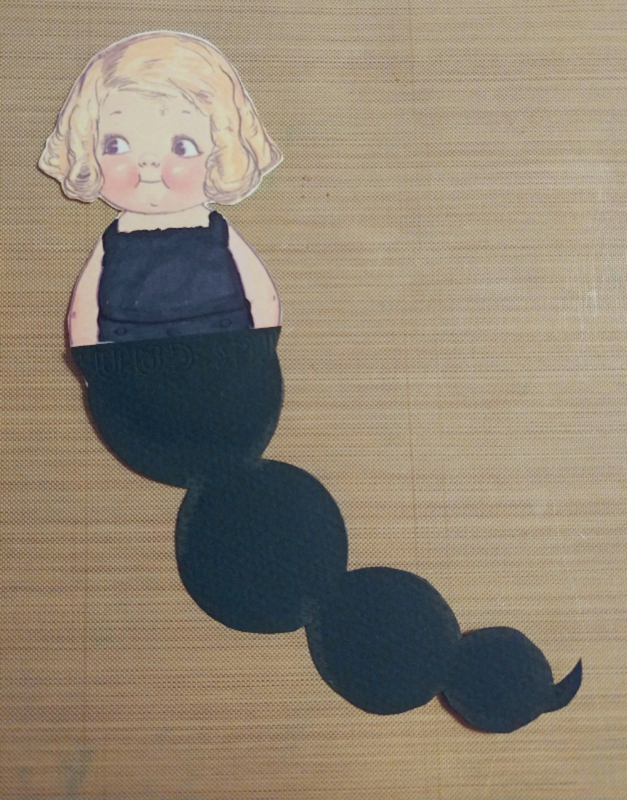 Mary's tail was added under her slip. 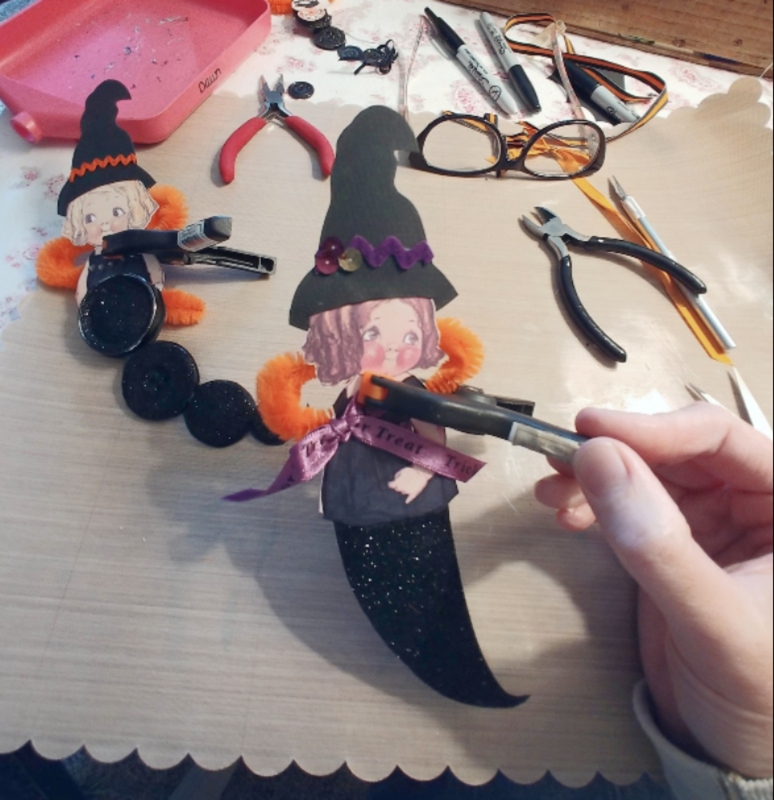 Next, we'll make the little hats. 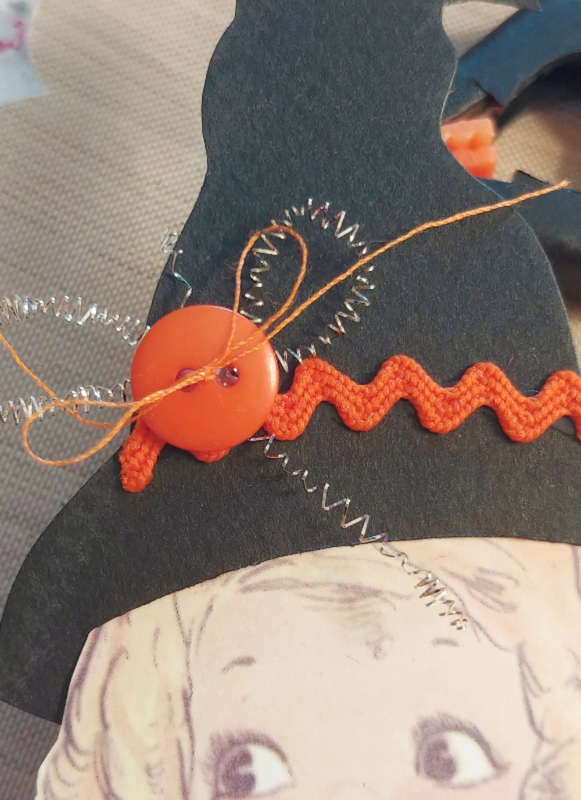 Draw a hat shape on the black cardstock and cut it out. You can kind of draw around her head so you get it the right size. You'll need the brim wide enough so that you can cut a slit for her head to slide into. 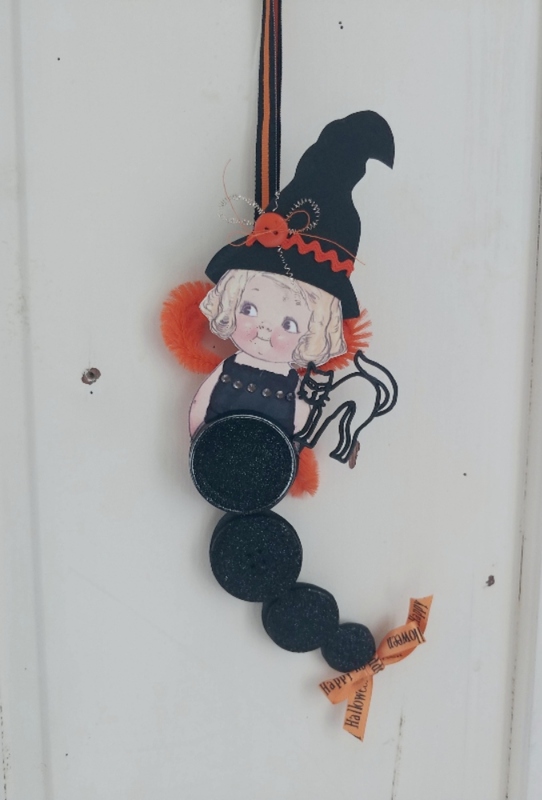 Don't fret too much about this, it can be just a straight up and down witch's hat and it will still be adorable! 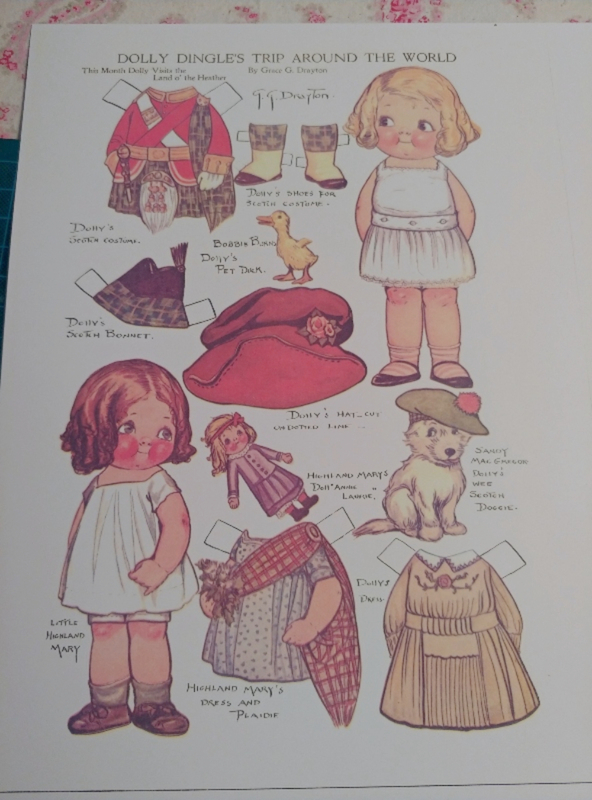 Hold her head up to the hat again after you've cut it out and mark the sides of her head. 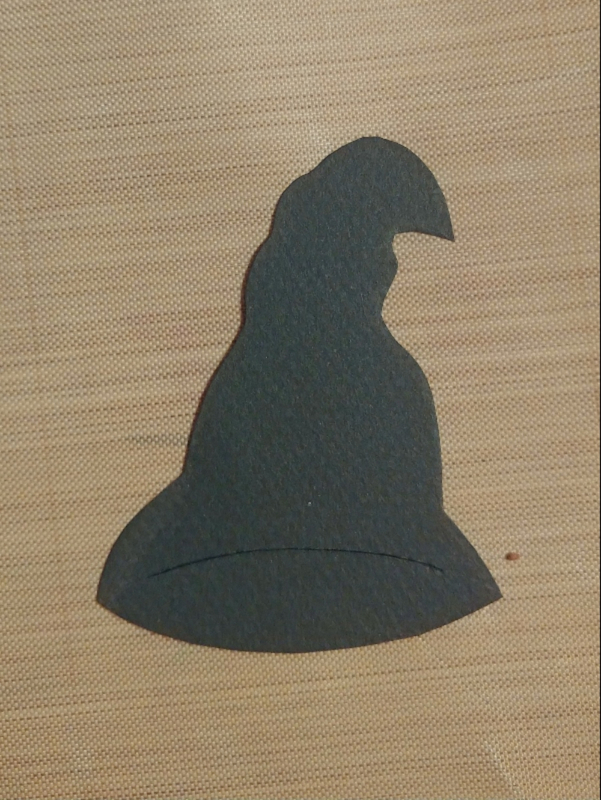 Cut a curved slit with an X-acto knife from one mark to the other so the hat will slide over her head. Put her hat on and add a couple of dabs of glue to hold it on. 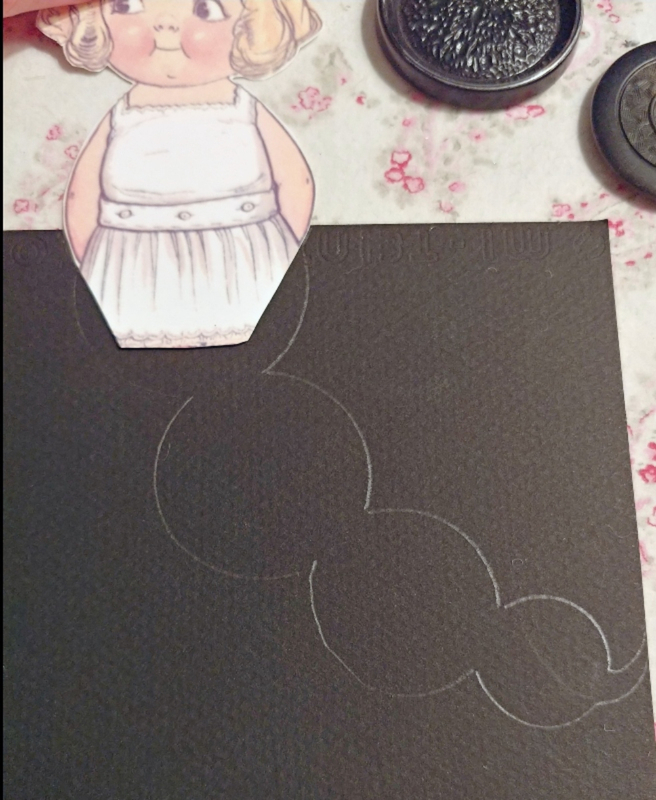 Now we will make her all sparkly and even more adorable with some glitter! 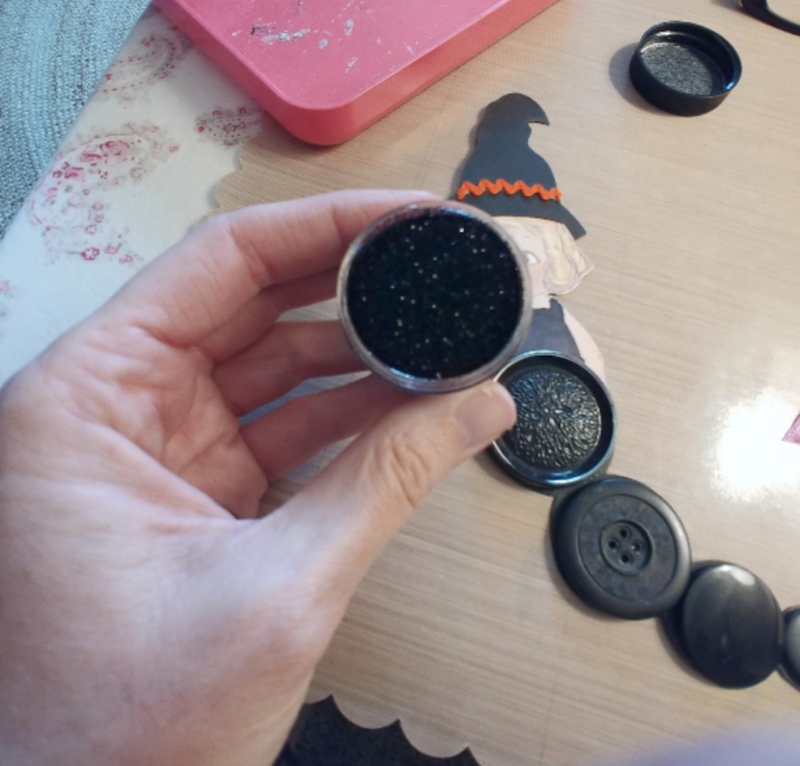 Rub some glue over all the buttons (a generous amount) and then sprinkle glitter over the glue. Do the same with Mary's tail. 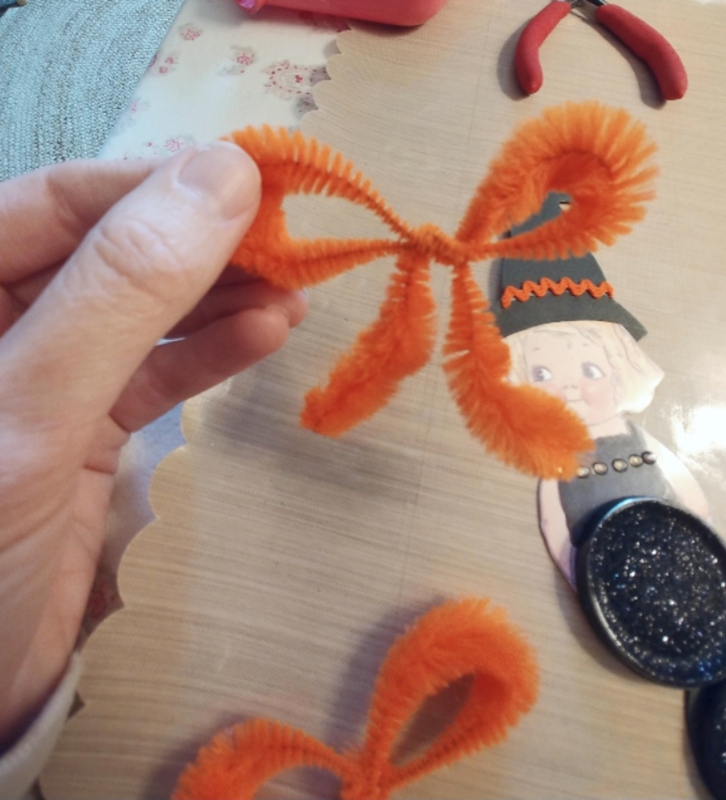 Bend a bump chenille pipe cleaner into a bow shape. You'll want the large part of the bumps to be her wings. Just twist the center a little bit to secure and then glue to her back. You'll need some small clamps or clothespins to hold this while the glue dries. 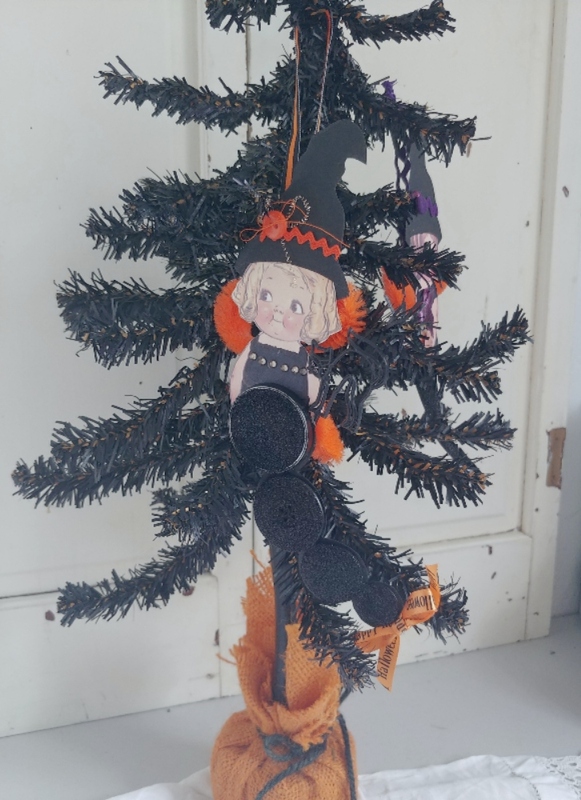 Now the basics are done so you can decorate her as you wish! 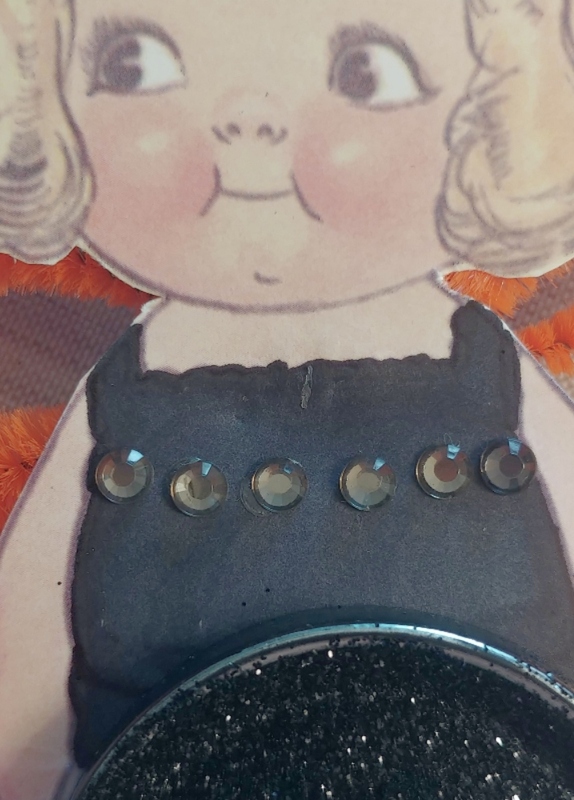 I added a row of black self-adhesive rhinestones along Dolly's dress. 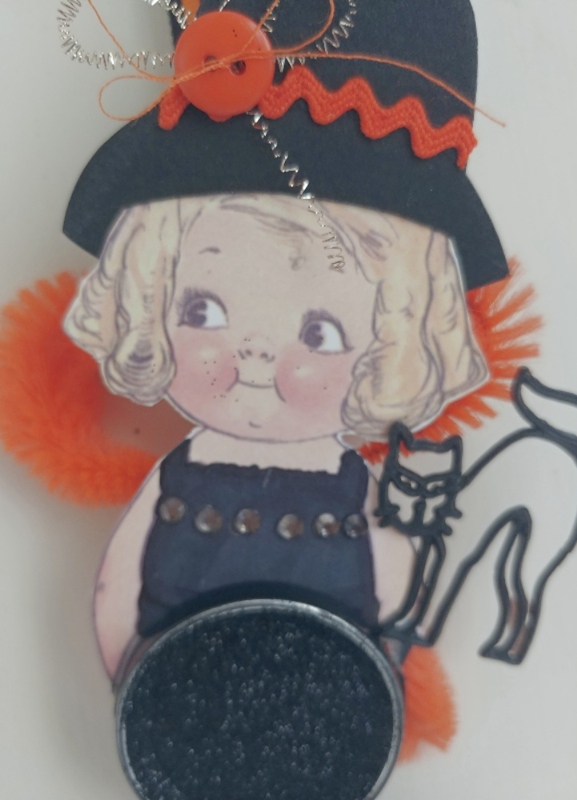 I used some small orange rick-rack along her hat and a button. 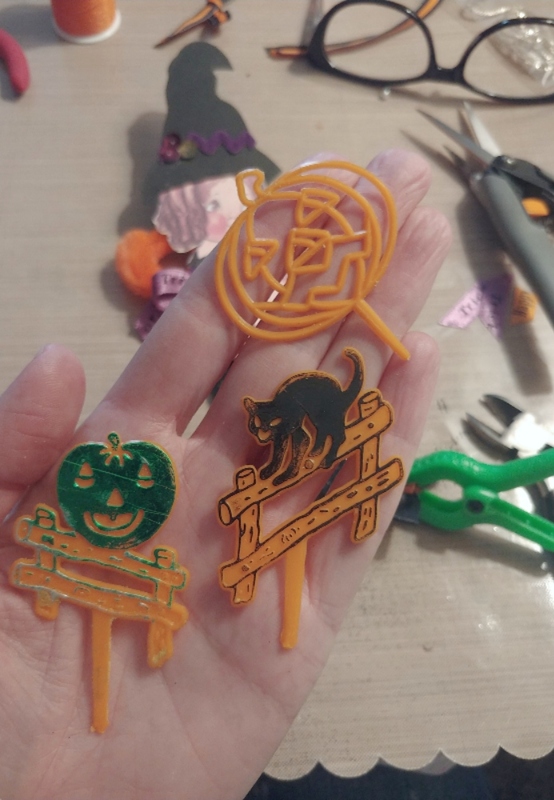 I had these old Halloween cupcake picks in my craft hoard so I chose a black cat for Dolly. Oops! She has a little glitter on her face! 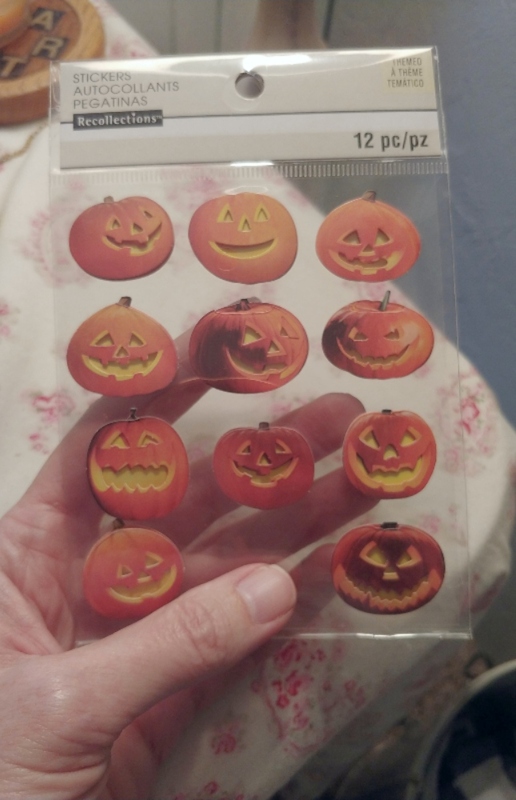 And I used one of these scrapbook pumpkins for Mary! 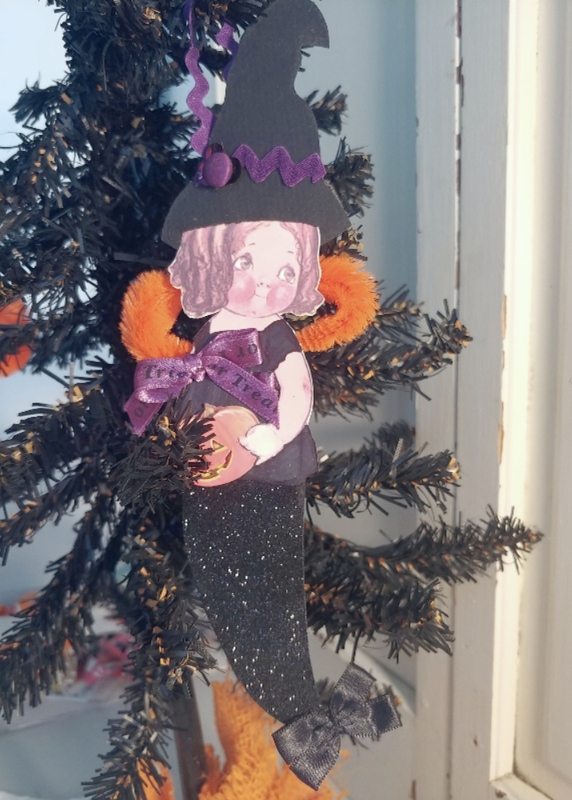 I used an X-acto knife and carefully cut around her hand so I could tuck the pumpkin under her hand like she's holding it! They each got a bow at the end of their tails! 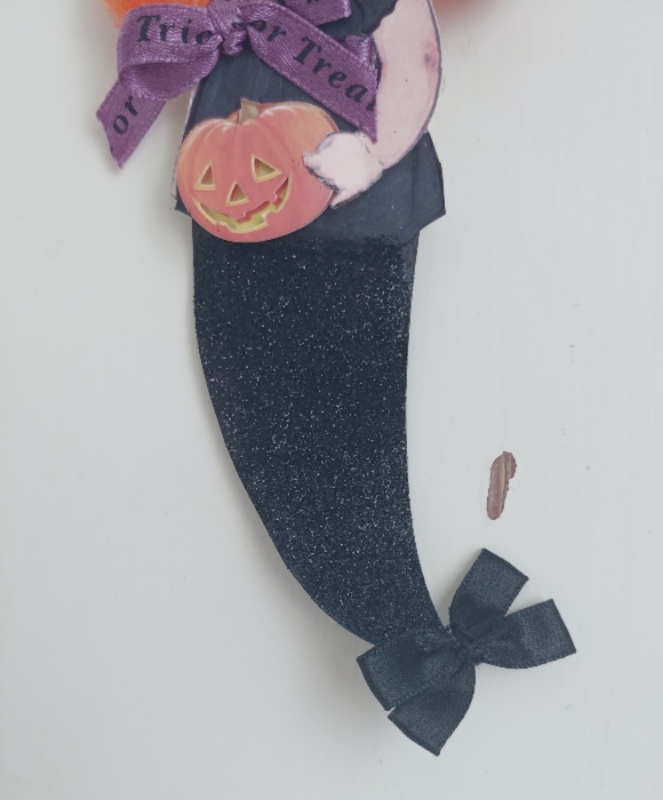 Add a ribbon tied around the back of her wings so you can hang her up! 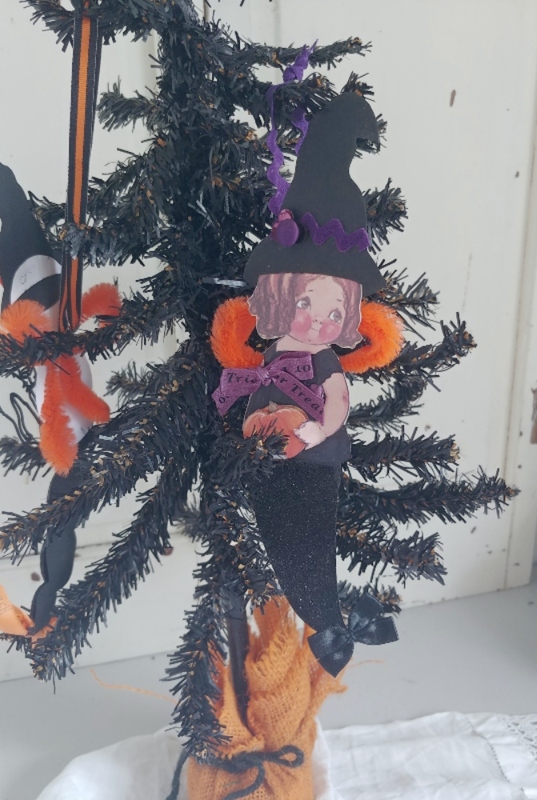 They look really cute on a Halloween tree! Now, if you hung out all the way to the end of the tutorial you deserve a reward!! 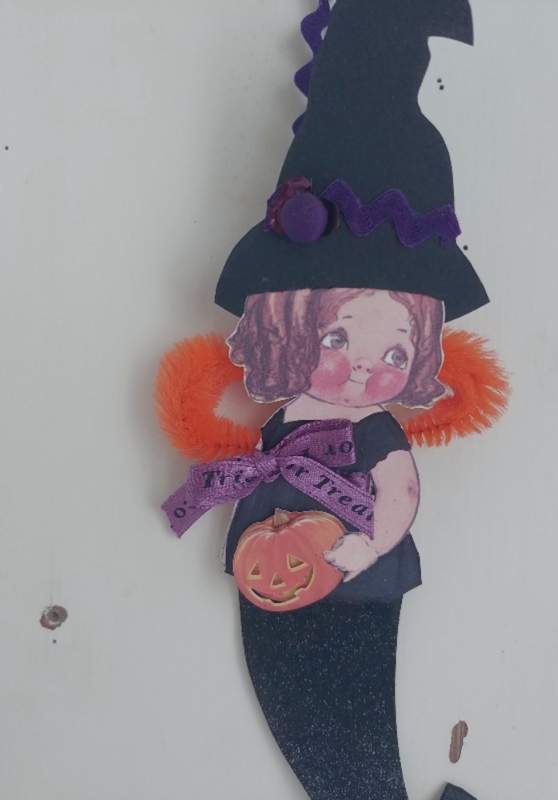 I'm doing a little giveaway, you can enter to win one of these cute little witches! 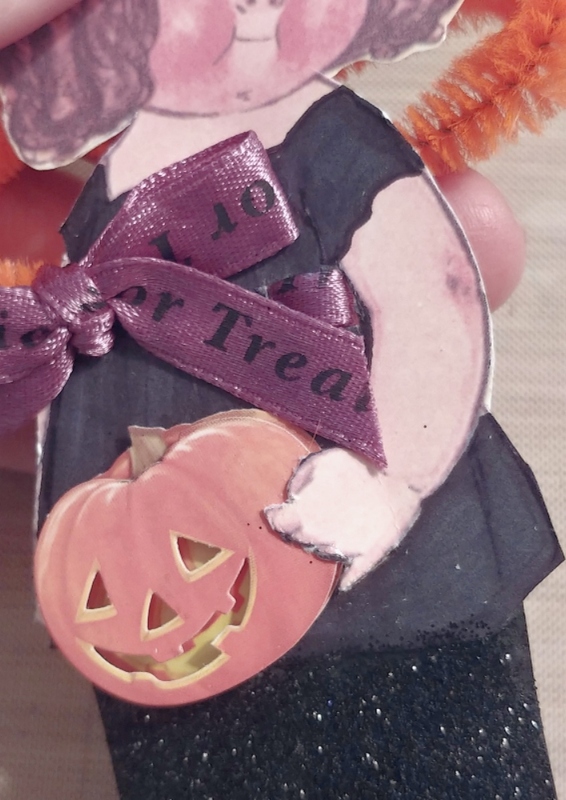 I'll choose a winner next Friday (the 19th) so I can get the winner's gifts sent out so you can enjoy them before Halloween!